The last time I exchanged emails with Wayne Lineberry was back in April of 2011. He was sick and he was fighting through – at that time – a painful stretch. I had emailed him to get his opinions on a piece I was researching to run on Bonesville (which is still in production). I knew his situation was not good and the prognosis for improvement was not a positive one. Still, the thing that struck me was that Wayne – ever enthusiastic to help the ECU cause – responded to each and every question I had sent to him (and there were a lot of them). It took him a few separate emails, but one of the things I have known about Wayne since I first really met him back in 2005 when we spoke several times as I wrote a Pirate Time Machine piece on him, was that he was very much a warrior in how he pursued each endeavor he undertook, long after his playing days ended at ECU. With each email he sent to me, you could see the struggle he was having typing, putting together his thoughts exactly how he wanted them recorded. On Tuesday, February 21st, Wayne lost his long, grueling battle with cancer. It was an 8 year war with the disease that, despite treatments and the pain associated with it, could not keep Wayne from participating actively with and on behalf of his beloved university and football program. After his family, ECU seemed to be his purpose and I am positive that the hope of the next football season played a big part in his ability to fight off this disease for so long. He was 65…far too young to go and particularly for a man who was a giant on the Dowdy-Ficklen grass, the passing is hard to cope with. 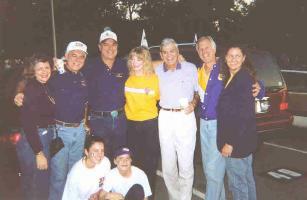 Passionate Pirate: Wayne, 3rd from left standing, at an ECU tailgate in 2004. If you played for or against East Carolina in the mid-to-late 1960s, you were acutely aware of where Lineberry was on the field. Opponents knew enough to start running away from him, and his teammates had been hit hard enough by him, that they wanted to be sure they were ready when he caught up the guy running away from him. One of his close friends and teammates, Don Tyson, sent me an email recently joking about how everyone ran away from Wayne and that Wayne used to kid him, saying that Don would have had any tackles without him chasing guys his way. That is so Wayne. He came into Clarence Stasavich’s Pirate program as a bruising linebacker, pushing the 230-40 pound range with an intensity that revealed the heart of true warrior. 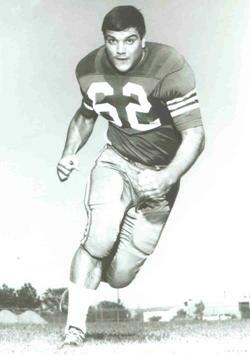 Having come from tiny Wadesboro High, where he often joked about the worst beatings he ever took were at half-time from his coach, then-future-ECU-coach Ed Emory, Lineberry was used to having to battle the big boys at every turn. Lineberry knew that the move would probably hurt his chances at the next level, and it probably did, though he was drafted in the 17th round by the Buffalo Bills, he did take great pride and the fact that he made the move, without complaint, and was ferocious at the job, helping lead his team to a stellar 8-2 mark in 1967, his junior season. But more than his physical prowess – he played center on offense too – Lineberry also excelled at being a teammate. He bonded tightly with his teammates and kept those ties hot, united, well after his playing days. He spent years connected to the Pirates Club, doing anything he could to help out the program, working with another fellow teammate, Dennis Young, who ran the PC for so many years. And, he was particularly interested in and active with football alumni and reconnecting them to the university as well helping to bang the drum with university on the importance of recognizing the past contributions of players. Most of all, he was a friend and someone to admire. I remember him once saying to me, “When it is football season, you go to see the Pirates play.” Simple as that. Rest in Peace, Wayne. 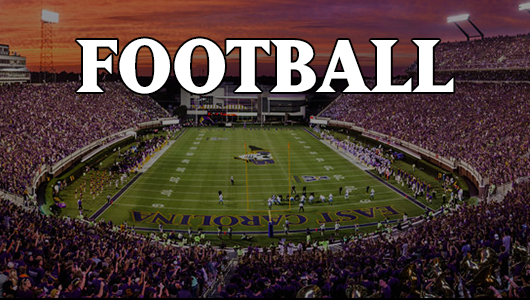 I know you will be watching the Pirates this football season from the ultimate sky box.